Facebook family already knows this, but I love roller derby. My good friend Sunny introduced me to it a few years back, and after getting the hang of being on skates for the first time since I was a little bugger, and slowly working my way to an awesome pair of new super awesome (albeit expensive) skates thanks to my Alaskan friend Shocker’s shop 2n1, I got pretty comfy on quad skates. Not enough to skate circles around anyone by any means, but I loved playing blocker. Shoulder hits. Plow stops. Smacking into a jammer on the run, sitting on a pack to slow them down. I love the aggression, I love the action. I love skating. I started derby in Alaska, on a very small team called the North Pole Babes in Toyland (from North Pole, Alaska. No, really–it’s a real place. Santa lives there.). I’ll spare anyone the team’s history, as I’m sure every team has their high points and low, but one of the most wonderful and at the same time CHALLENGING things about derby is that it’s all self-run. The skaters run the team. That means logos, merch, websites, fundraising, sponsorship, you name it. They do it all. Since I got in at ground level, I was lucky enough to have been given full reins with graphics and web design. 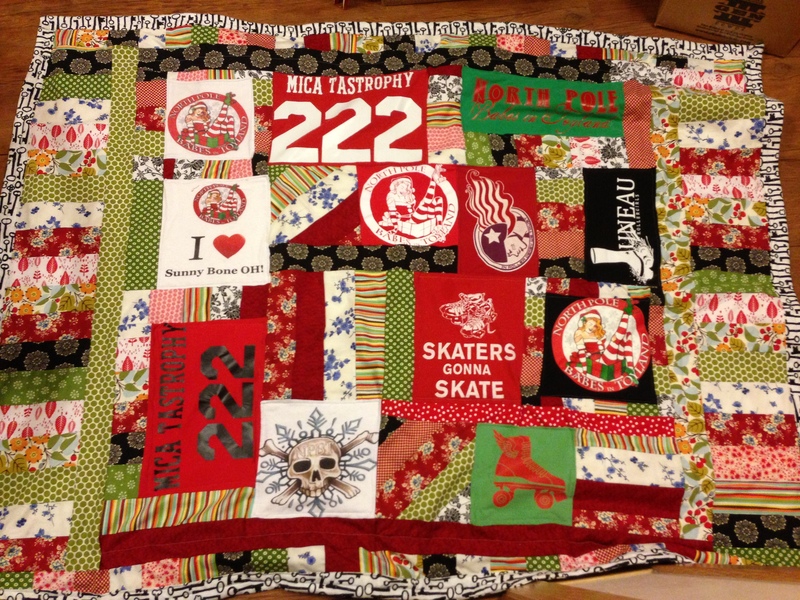 I designed NPBT’s logo (the Christmas girl in skates shown a few times in the quilt above), along with an alternate logo (the skullflake in the lower portion). I designed t-shirts and merch (along with other derby designs) for the team (which are still available here). Although drama surrounds any good group, I enjoyed myself, and I loved what we had created. When we moved from Alaska, I had to leave the team. I had survived a bruised & torn collarbone, a badly sprained ankle, bruised jawbone, and tore some ligaments in my knee thanks to derby, and enjoyed nearly every minute of it. Now my ol’ bones are creaking, and whether I find another team and play again, or go zebra (referee), or forgo it altogether, I will never forget how awesome derby was for me. I loved it. I breathed it. I snuggled up in it. Well, I wanted a way to commemorate my derby time in the frozen north, and you amass a HUGE amount of t-shirts in derby. So I decided to make a t-shirt quilt. I wasn’t crazy about the square, sterile blocky versions I’ve seen around. That’s just not derby. Derby is crazy and mixed-up and all over the place. So I gathered some of my favorite NPBT shirts (plus a Juneau shirt from my first away bout) that I was willing to transform, and cut out the best parts of them. I began by cutting the shirts to a roughly similar size, then I started piecing them together in random strips of regular fabric. Since our colors were mainly red & white and our theme was somewhat year-round Christmasy, I was a little worried about it looking like an ugly Christmas sweater, so I added other fabrics I thought were awesome. And there you have it! A little wonky, a little crooked, and a whole lotta cool and snuggly. …And believe me, I still have TONS of derby shirts left over…. 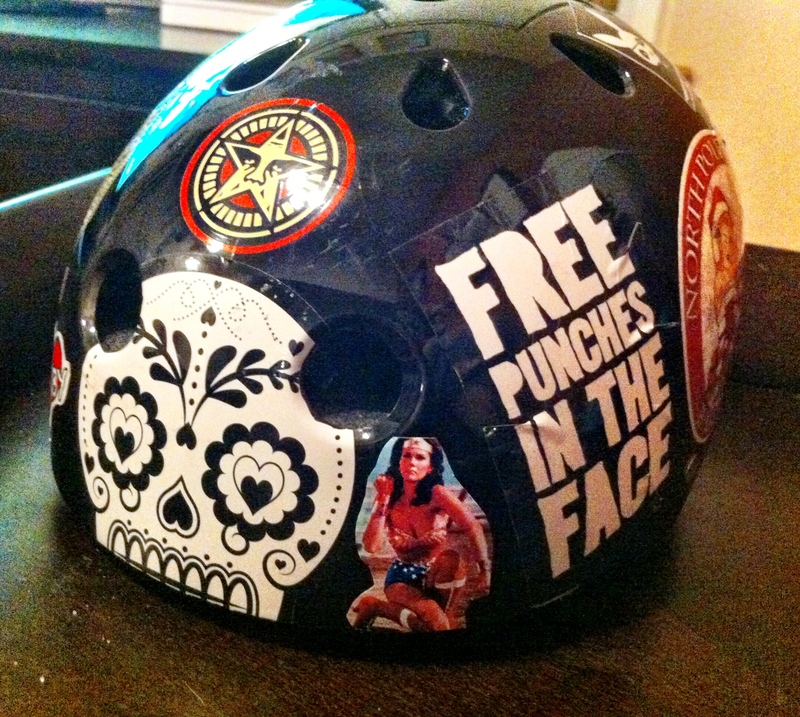 Not to mention a ton of patches on my skate bag and stickers on my helmet. Love it! I think it turned out great. Wonky and crooked can be good things. 🙂 I started making a tshirt quilt a few years ago, then my sister had kids and I made them each quilts. I should really finish it. It has some of our AHS t-shirts (Sr year tshirt, wrestling, soccer) and other sports and fun tshirts I’ve collected for 25-30 years. You should definitely do something with them….and post pics on FB when you do!